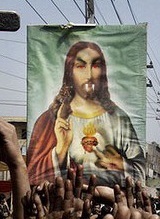 “More Accurate” portrayal of Jesus according to protesters. Riot police reinforcements were called in and the crowd dispersed at around 11pm. An estimated $7 million dollars in damages was left smoldering in the streets. The ‘Son of God’ movie pulled in $26.4 million dollars, a close second to Liam Neeson’s ‘Non-Stop’. Proving once again that Liam Neeson is greater that Jesus. This entry was posted in Uncategorized and tagged evangelical Christians, Jeremiah Smithson, Son of God by emasinmancy. Bookmark the permalink.